2001 Launch Team Xbox: How Many? Discussion in 'Rare and Obscure Gaming' started by GoTeamScotch, Jul 15, 2016. Hey everyone, newcomer here. Been a lurker for a while though. I picked up this 2001 Launch Team Edition Xbox last week. I've owned what must be close to a hundred Xbox's by now so this was a really cool find to get. Can anyone tell me how many of these were actually produced? The common number I keep seeing is 60 to 100 units, though I'm not sure if everyone is just passing around the same number some guy edited into Wikipedia or something. Anyone have any info about that from [somewhat] credible sources? ive seen atleast 15 of them in my lifetime (online and for sale) id say their are atleast arround 200 it seems. One of these guys would know. Hex and Borman would better know. My thing is really 360. But I would have gone with the universally selected 60. There were hundreds if not a few thousand made. The data was sadly lost so exact numbers are impossible. 60 is complete BS, they had to have them available for purchase by those who worked on the Xbox. That number being crap was confirmed, so there is no doubt in my mind that many more were made. Now, the bigger question is how many were actually sold? MoonTar, A Toubib, XboxSurgeon and 1 other person like this. Interesting. I initially suspected that the number of units produced would probably be deflated as much as possible by people who own them. I'm sure not everyone is like that but if you're trying to sell one or show one off to people, it's in your best interest to keep the rarity factor as high as possible so for that reason it wouldn't surprise me if more were in fact made. I'm surprised though that you say it can be up in the thousands. Not saying you're wrong, just that it's surprising. You said "that number being crap was confirmed", can you elaborate on that confirmation? Is there a thread somewhere where this was discussed before that I can read through? How big was the original launch team anyways? I've also read that even though a number of them were produced, not all were sold and some were destroyed. So would the Partner Edition Xboxes be the same way? 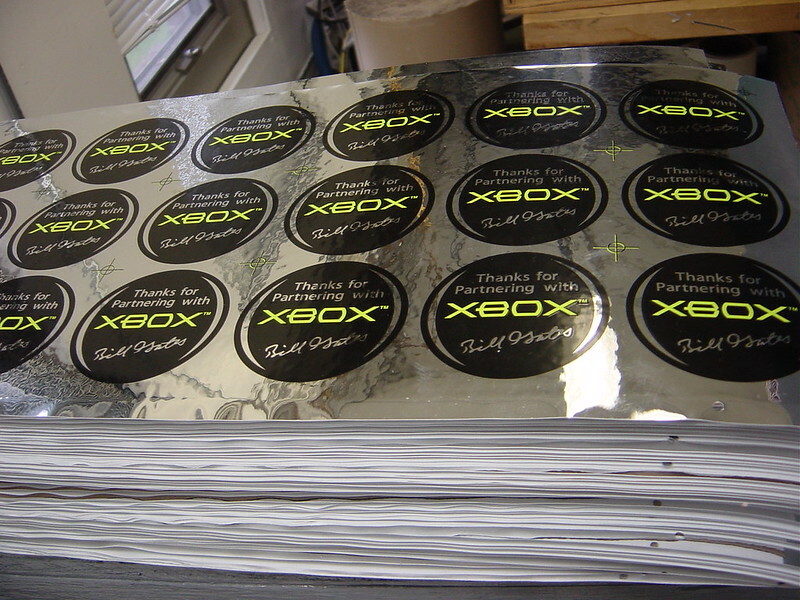 These were given to companies that partnered with Xbox and supplied parts for it. Wikipedia states there were 60 of those and 100 of the Partner Editions... with a glaring [CITATION NEEDED] next to those figures. I've ran extrapolation from ebay sales ratio if you compare total no. sold (24million) vs no of listing per year. If you compare it to the no. of LT's sold on ebay, you get like a estimate of 200-600ish consoles are likely roaming around. But since it's an extrapolation and is based on current sales. It means noffin to how many were made. I was just trying to debunk the 60 estimate, which we pretty much crushed years ago. @MoonTar has record of how many have been sold the past 3 years, and with the number of these that are on this site alone, 60 is a way off number. Partners are a different problem estimating all together, bc they were given to a lot of companies as kind of a trophy prize. So no one really owned the consoles unless they were gifted, raffled off to employees, or went bankrupt and had to sell assets. Some ended up in company glass cabinets. Some ended up in storage. So there are probably just as many? Don't quote me. They are just harder to find in public. jakeeeenator, gaming247, CrAzY and 1 other person like this. I went and found the Orange Xbox thread again. This was actually the first thread I read on AG forums. Still a fun read. I actually live an hour's drive from Redmond and the area where that orange case was found. My Launch Team Xbox I got from Tacoma WA (30 mins from Redmond). Who knows, maybe the last person to own it was part of the original launch team. This one I am really fuzzy on. I think we made a few pallets and had the higher ups send them out for Christmas to partners. There are a ton of stickers there, but probably less than 1000, maybe even less than 500. I would have just had the stickers/jewels made, sent to the factory, then had them stick them on and someone else would have dealt with it since it was just regular colored consoles, if I remember correctly. Wow that's a interesting. So I count about 50 sheets in that photo which would be 900 jewel stickers (18 per sheet). But stickers alone don't directly equate to there being that many Xboxes but it is pretty damning evidence that the 60 number is crap. Unless someone made a big printing mistake, it's probably safe to assume at least half of these were used on real consoles. So maybe 400 or 500? According to Wikipedia, Partner consoles are more rare than LT ones . Wiki is neither wrong or right. Both consoles nobody knows the numbers. So we don't know which is rarer than what. Partners are less common in the wild just by the nature of their distribution to companies rather than people. That doesn't necessarily mean there were less of them made. I know it's not the answer you were looking for, but it's all we know unfortunately. My confirmation came from the head of manufacturing. Like i said, the exact number was lost in a hard drive crash when the Xbox was still current, but I've never found a single citation for 60 units. I can completely understand not having an exact number 15 years later. I'm glad to get any extra details about this. It's a little disappointing but I still got the unit for half of what it's worth so I'm happy. @Borman - did you use to work for MS? He is the one of two Master Jedi we have on all things OG Xbox. Haha for sure. I'm starting to see that. 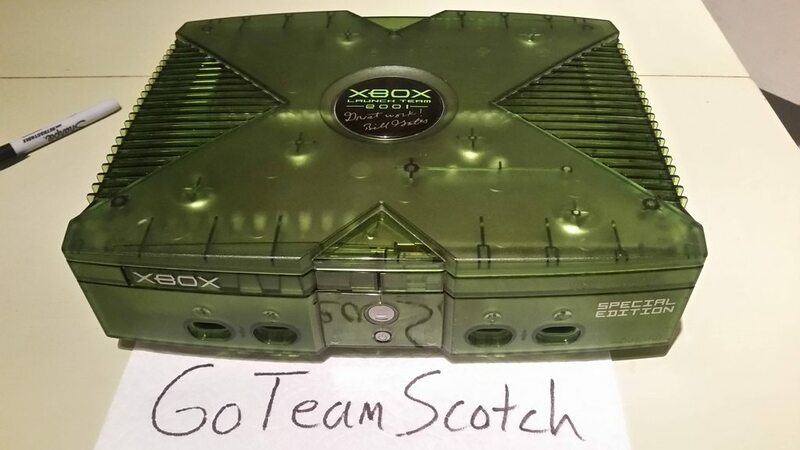 I just joined this forum yesterday and already I've seen more ultra rare Xbox items than I had ever seen in Xbox-Scene, Xbmc4Xbox, or some of the other Xbox forums I've frequented over the years. Just got done drooling over borman's 27 page thread, then hopped over to moontar's and then hexagon's. 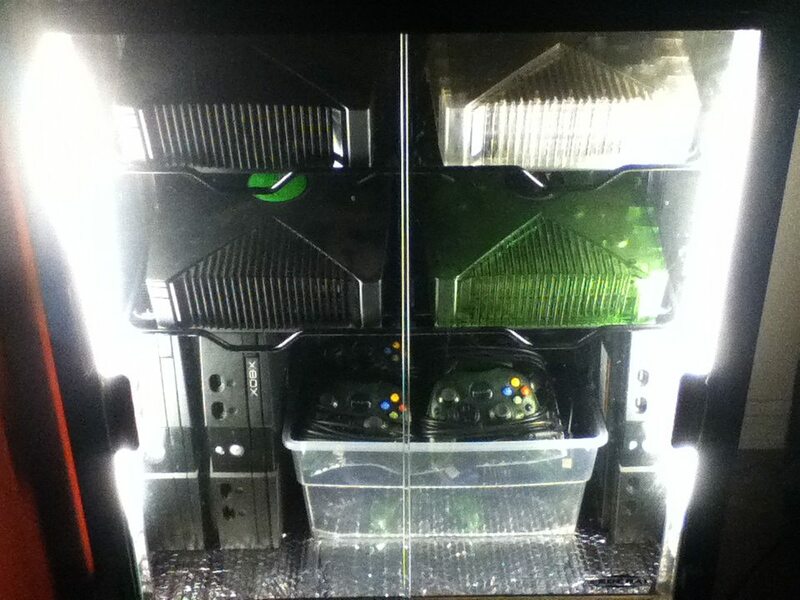 I have 20 Xbox's sitting in my display case and you all make me feel like a bloody amateur! Using eBay can be tricky for counting the number of sold units, I've seen several consoles sold multiple times each on eBay and on here at Assemblergames they have exchanged hands as well. Have a picture of your display case? I got some cool pictures in the Media thread. Wow there's a lot of cool photos in there. There's so many controller colors I didn't even know existed! The dark red and glow in the dark ones are wild. This a food case I got from a local starbucks. 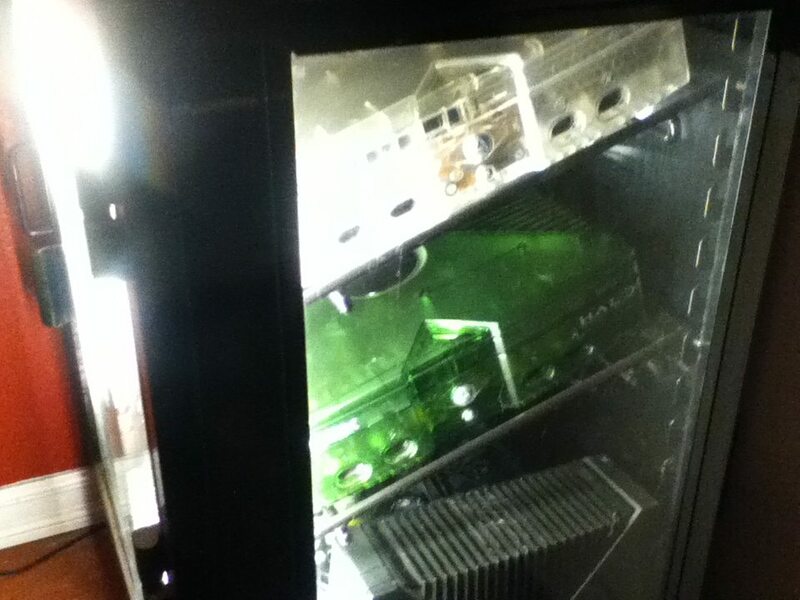 Replaced the fluorescent lights and padded the bottom to prevent scratches. Thick glass windows and the front is split in 2 and each can slide open and the front door swings out. The racks are the perfect size for holding Xboxes. Max it holds 10, then there's usually a stack on the top. Nothing too special about the contents at the moment. I usually sell my customized ones. The Halo Green we made 100,000's of (wiki says 200K, that is probably right). The Mountain Dew, wiki says 5000 made, but I think it was more like 800-1000. The Hulk version was <50 (the only difference from the MD version is the jewel sticker). The employee launch edition was also probably in the mid hundreds or <1000 just because the entire team was so small at the time. The white Panzer Dragoon unit is my favorite because of how hard it was to make. We intended to make about 2500-3000 but the black stripes were hand screened onto the top. We were up all night in the factory sorting and grading them to get the best ones, we only ended up shipping around 1300. Yeah it is, I found a post he made a long time ago about working at Microsoft and got his name. Borman then tracked him down and brought him here to Assemblergames. He was loaded with information and awesome pictures from back in the day. Thanks for reaching out. Just recap, and tie things together, I was the one that GoTeamScotch, Borman and Emilio (orange console guy) reached out to. I made ALL of the original Xbox special editions in the first generation console time frame (2001-2005) The photos in the Metal Jesus video were my photos, with me in them, I posted, or sent to guys like Borman to use (with my permission) in forums like this for the fans of the Xbox. My life (and literally), blood, sweat, and tears went into making the original Xbox console, and all of the first party (MS) special editions. I'm here to help clarify, correct, substantiate, or just answer questions to the best of my ability where possible out of respect to the fan community of the Xbox, which I am greatly appreciative of. I am here to be a resource to you, to the best of my ability...just keep in mind, it was a long time ago, and like some of the posts mentioned, I lost my HD around 2003, which had may of the hard figures for the more obscure special editions (like Hulk and Mt Dew - which were personally some of my favorites, outside of the Panzer Dragoon). Syclopse and A Toubib like this. Ok, this one is a "Launch Team Special Edition". We made between 1000-1100 from what I can remember ( I say this with about 80% confidence, we could have made upwards of around 2000, but that would have been MAX). These were never sold, and never intended to be received by anyone outside of MS. They were only given to the Xbox launch team, and likely some MS execs or related teams. Around lanch time (November 2001) the entirety of the Xbox team would have been around or close to 1000 people when you include all of the teams (Hardware, ATG, Dev, First Party Games and Games Studios, Marketing, and all of the additional groups I am sure that exited but I was not aware of). I recall it was a big deal to give these out because production was a bit delayed, and we had publicly declared commitments to the market, so Balmer was a bit hot about diverting 1000 units to the internal team - but it was done anyway (probably due to the insistence of guys like J Allard, Ed Fries, and Robbie Bach - these were good guys to work for at Xbox). As a side note, a similar thing happened at the launch of the Xbox360, except due to the low manufacturing yields (related to RROD), Balmer made an even bigger stink around allocating consoles to the launch team. We got them anyways - then they promptly died 2- 8 months later (RROD). Syclopse, jakeeeenator, skyway1985 and 2 others like this.